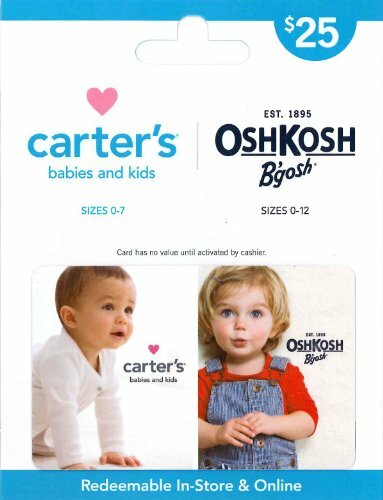 Carter’s and OshKosh B’gosh are the two must trusted brands in children’s clothing. Their heritage of innovation, quality, and value has earned them the trust of generations of families. Explore clothing essentials, sleepwear, gifts and accessories for children in sizes from newborn to 12. If you are trying to buy a gift for a shower or birthday this could be the card for you. Count on Carter’s & OshKosh B’gosh for the sweetest looks for your little miracle. 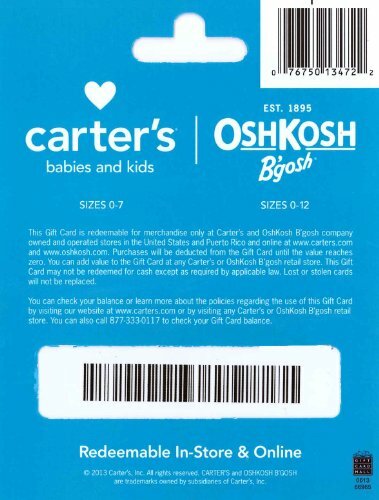 Redeemable for merchandise only at Carter’s and OshKosh B’gosh company owned and operated stores in the United States and Puerto Rico and online at www.carters.com and www.oshkosh.com. Shop your favorite brands including Carter’s, OshKosh B’gosh, Child of Mine, Just One You, Genuine Kids and Precious Firsts.